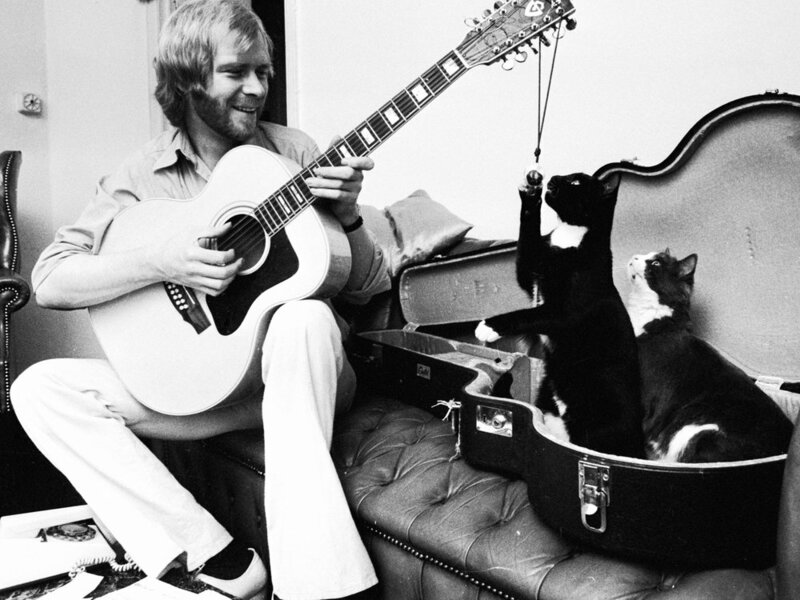 John William "Long John" Baldry was born today, January 12, in 1941. He was a Canadian-English blues singer and a voice actor. He sang with many legendary British musicians, including Rod Stewart and Elton John, who also appeared in bands led by Baldry in the 1960s. He enjoyed pop success in the UK where "Let the Heartaches Begin" reached No. 1 in 1967 and in Australia where his duet with Kathi McDonald "You've Lost That Lovin' Feelin'' reached number two in 1980. Baldry grew to 6 ft 7 in, resulting in the nickname "Long John." He was one of the first British vocalists to sing blues in clubs. In 1968, Elton John tried to commit suicide after relationship problems with a woman. Bernie Taupin, the lyricist, and Baldry found him and Baldry talked him out of marrying her, helping make Elton John comfortable with his sexuality. The song "Someone Saved My Life Tonight" from Captain Fantastic and the Brown Dirt Cowboy was about the experience. In the early 1960s, he sang with Alexis Korner's Blues Incorporated, with whom he recorded the first British blues album in 1962, R&B from the Marquee. At stages, Mick Jagger, Jack Bruce and Charlie Watts were members of this band while Keith Richards and Brian Jones played on stage. When The Rolling Stones made their debut at the Marquee Club in July 1962, Baldry put together a group to support them. Later, Baldry was the announcer introducing the Stones on their US-only live album, Got Live If You Want It!, in 1966. Baldry became friendly with Paul McCartney after a show at the Cavern Club in Liverpool in the early 1960s, leading to an invitation to sing on one of The Beatles 1964 TV specials, Around The Beatles. In the special, Baldry performs "Got My Mojo Workin'" and a medley of songs with members of The Vernons Girls trio; in the latter, the Beatles are shown singing along in the audience. In 1963, Baldry joined the Cyril Davies R&B All Stars with Nicky Hopkins playing piano. He took over in 1964 after the death of Cyril Davies, and the group became Long John Baldry and his Hoochie Coochie Men featuring Rod Stewart on vocals and Geoff Bradford on guitar. Stewart was recruited when Baldry heard him busking a Muddy Waters song at Twickenham Station after Stewart had been to a Baldry gig at Eel Pie Island. Long John Baldry became a regular fixture on Sunday nights at Eel Pie Island from then onwards, fronting a series of bands. In 1965, the Hoochie Coochie Men became Steampacket with Baldry and Stewart as male vocalists, Julie Driscoll as the female vocalist and Brian Auger on Hammond organ. After Steampacket broke up in 1966, Baldry formed Bluesology featuring Reg Dwight on keyboards and Elton Dean, later of Soft Machine, as well as Caleb Quaye on guitar. Dwight, when he began to record as a solo artist, adopted the name Elton John, his first name from Dean and his surname from Baldry. In 1967, he recorded a pop song "Let the Heartaches Begin" that went to number one in Britain, followed by a 1968 top 20 hit titled "Mexico," which was the theme of the UK Olympic team that year. "Let the Heartaches Begin" made the lower reaches of the Billboard Hot 100 in the US. In 1971, John and Stewart each produced one side of It Ain't Easy, which became Baldry's most popular album and made the top 100 of the US album chart. The album featured "Don't Try to Lay No Boogie Woogie on the King of Rock and Roll," which became his most successful song in the US. Baldry had mental health problems and was institutionalised for a brief time in 1975. The 1979 album Baldry's Out was recorded after his release. After time in New York City and Los Angeles in 1978, Baldry settled in Vancouver, British Columbia, where he became a Canadian citizen. Baldry was out as gay during the early 1960s, at least amongst his friends and industry peers. However, he did not make a formal public acknowledgement of this until the 1970s—possibly because until 1967 in Britain, male homosexuality was still a criminal offence that could lead to forced medication and/or jail time. Baldry had a brief relationship with lead-guitarist of The Kinks, Dave Davies, and supported Elton John in coming to terms with his own sexuality. In 1978 his then-upcoming album Baldry's Out announced his formal coming out, and he addressed sexuality problems with a cover of Canadian songwriter Bill Amesbury's "A Thrill's a Thrill." Baldry died July 21, 2005, in Vancouver General Hospital, of a severe chest infection. He was survived by his partner, Felix "Oz" Rexach.